ISBN# 1460210425 Dramatic. Engaging. Filled with valuable insights. ‘Heart of Love Evolution’ breaks the stigma of depression and gives hope to anyone dealing with depression. Terezia Farkas challenges thinking that says depression is a weakness or embarrassment. A self-care book, full of insights and tips dealing with depression and emphasizing self-love and hope. Similar to James Van Praagh, ‘Heart of Love Evolution’ answers what’s next for your soul after suicide or why your soul would even choose to experience depression. ‘Heart of Love Evolution’ is a valuable tool for caregivers, family, and friends. ​Visit Terezia Farkas at Amazon.ca, Friesenpress, Barnes & Noble for all her written titles. This book has real value because it shares the ideas that allowed the author to overcome her deep state of depression. Terezia openly shares her own battle with deep depression and her personal journey is dramatic and engaging. Her experiences with depression will resonate well with people.. 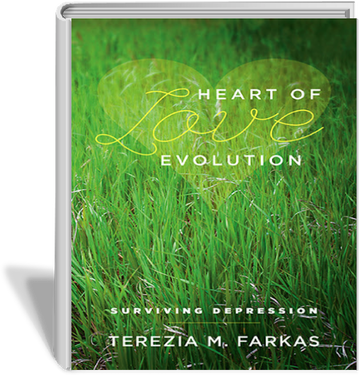 In Heart of Love Evolution - Surviving Depression, Ms. Farkas shares her journey of recovery from deadly depths of depression, guided by newfound hope and spirituality. It is well written and the expression of her experiences with depression will resonate well with people, as will the emphasis on self love and hope. Heart of Love Evolution is the story of her own confrontation against the dark demon many of us must face every day. As Ms Farkas intuitively points out so well in this book, the demon may be beaten down but never truly obliterated. She grasps the KEY POINT - as many do not – that this darkness is a PERSONAL thing, self-structured to each and every individual, and can only be described in its own, unique terms. Heart of Love Evolution is well written and a frank, at times harrowing account of a period in the author's life, when desperation and depression was a leading theme of her existence. The book vividly describes Terezia's deepening despair that eventually brought her to not only question the meaning of her life, but also contemplate other elements that contributed to her state of depression, such as her soul path, the karmic and previous life influences, and a possible legacy of her ancestral links. Visit Terezia Farkas at Amazon.com, Friesenpress, Barnes & Noble for all her written titles. Disclaimer: The author and publisher of this book do not dispense medical advice or intend any material to replace medical advice or treatment for any emotional or physical problems, and therefore assume no responsibility for the reader's actions. The intent of this material is to provide supplemental information and advice to aid emotional and spiritual growth. Please seek professional help when distressed.